100 Year Old Poet Willnetta McNeely is our first featured Hoosier Author! It is an honor to have Willnetta Eileen McNeely as our first featured Hoosier Author! 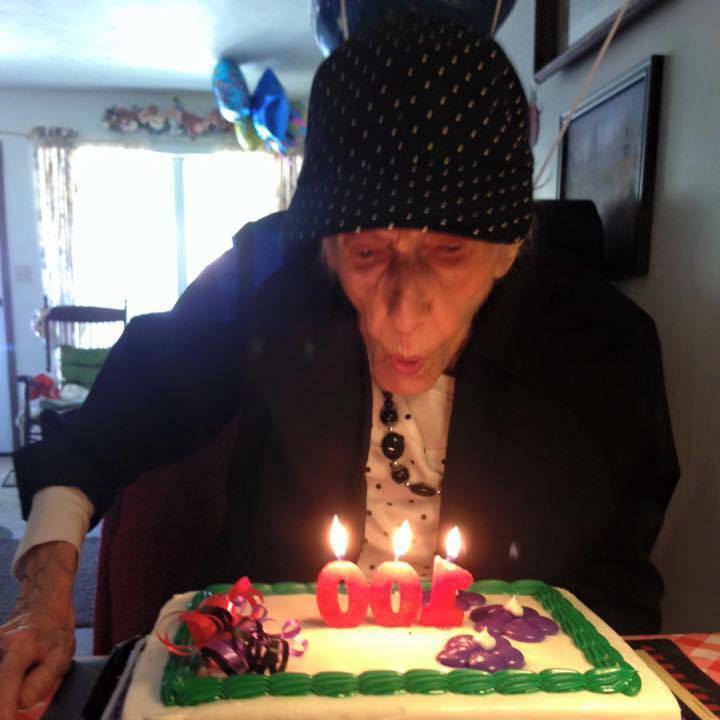 Willnetta turned 100 on August 21, 2015, which by itself is an amazing accomplishment. Combine her centennial celebration with the fact that she published her first book this year and you have a super inspiring life event and legacy. How wonderful that Willnetta gets to see her words and stories in print for the world to read. It proves to the rest of us aspiring authors, artists, musicians and dreamers that it is never too late to live your dreams! 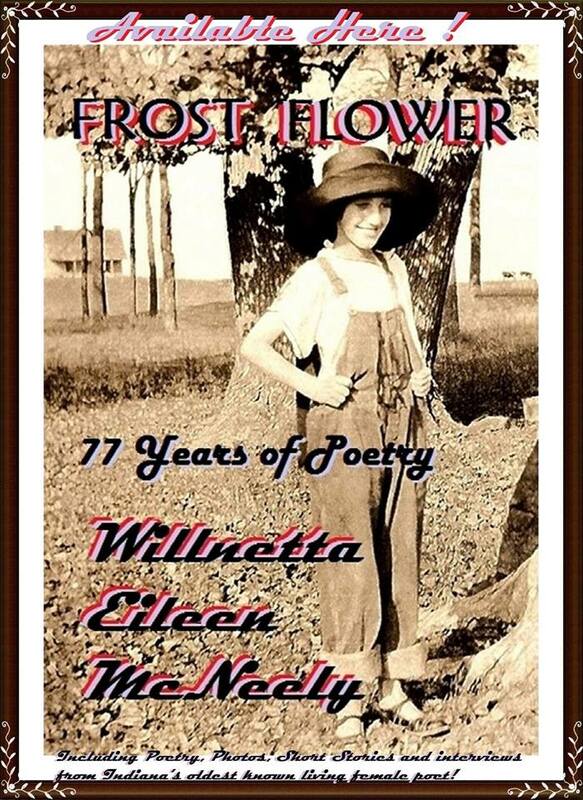 Willnetta’s book, Frost Flower is a culmination of 77 years of her poetry! Wilnetta’s writing is raw and real. She talks about everything from blood-stained shirts to the power of music and love in her life. Her humor is evident too, especially with the poem “Kissing Me”. I love Willnetta’s strength that shines in “I Don’t Ask Anyone” where she boldly states that she likes herself in many ways to “Help Me to Understand Myself” where she lives without fear and releases resentment daily. She also shares her vulnerabilities in poems such as “Substitute”, “Funeral”, and “Impossible” where her heartache is palpable. Willnetta’s poems make you think about the ebb and flow of life and then she extends an adventurous invitation to go back in time for a glimpse of the incredible journey of her life through short stories where she talks about experiences most of us can’t even imagine from taking a horse drawn wagon to get groceries in “Duck Town” to treating herself with a trip to the local theater to watch silent films while someone sat at the edge of the stage and played the piano to fit the action on the screen. How fascinating that must have been. It sounds fun to me even now. In our advanced age of technology, I often find myself longing for simplicity, but I wonder how well we would weather a prolonged pioneer lifestyle? No electricity or indoor plumbing? No TVs, computers, cell phones, internet… all these things we take for granted really makes me think about how many changes Willnetta has seen in her lifetime. Willnetta also tells a couple eerie stories that will make the hair stand up on the back of your neck! One of the stories is about a woman going to meet her son at the airport. What happens along the way really makes you think about the afterlife. “The Conway Story” has a surprising twist that would rival any horror story on the big screen! Reading her stories made me want to know more and more I got. I love books that go behind the scenes, talk about the writer’s life and what inspires their writing. Enter Willnetta’s grandson Bruce Hellington, a musician who has been profoundly inspired by his grandmother. From Bruce’s point of view we get to see the woman behind the poetry and how she influenced him and his art. Bruce’s devotion to his grandmother speaks to me on a deeper level than as a poet and lover of the written word. I too wish to inspire my grandchildren and instill a love the arts in them. I am also in awe that Bruce was able to get his grandmother’s poems published. I wish that I could have captured my grandmother’s words in a book. I always saw my grandmother writing as I was growing up, but I never knew what she wrote and when she passed away, her journals were nowhere to be found. To see Willnetta’s words come to life, especially in the final scene of life’s journey soothes my soul and gives me hope that someday my grandchildren will understand the connection that one generation can have with another to leave a legacy of never giving up and to keep pursuing your dreams no matter what obstacles may come your way… that is the power of poetry Willnetta so gallantly portrays. I hope you get an opportunity to read Frost Flower and are inspired to start keeping a journal or even write your words down on the back of junk mail or brown paper bags like Willnetta did! P.S. To order Willnetta’s wonderful book via Paypal send, $20 ($15 + $5 s/h) for softback, $30 ($25 + $5 s/h) for hardback to frost.flower77@yahoo.com. Don’t forget the “.” dot between the words “Frost” and “Flower”. For other payment methods and to learn more about Willnetta, VISIT WILLNETTA’S FAN PAGE. P.S.S. I will have a limited quantity of Frost Flower books available at the Hoosier Authors booth September 24-27, 2015 during the James Dean Festival at the Ducktail Run located in the Gas City Park. Look for the booth with books (all by Hoosier Authors) and porcelain hearts. One more thing… I would love to know your favorite poem from the book! Share your favorite title with me and I will share my favorite with you! I actually have two favorite poems from the book. There are so many I like, but these two poems are so wonderful. I think they should win a Pulitzer prize! Hmm, there’s an idea. I already think Willnetta would qualify as the world’s oldest living poet, but a Pulitzer too? Anything is possible! Happy birthday! To live 100 is accomplishment and poetry itself. I would like to order her book.